This sensational cascade is situated at Kalhattipura in Chikmalagur district of Karnataka, almost 10 kilometers from Kemmangundi hill station. The waterfalls, falling from the crest of Chandra Drona hill at a height of 400 ft, enhance the scenic beauty. This sublime place also harbours the Veerabhadreshwara temple, which is dedicated to Lord Shiva. The temple has exquisite architectural engravings and attracts innumerable pilgrims during the annual religious fair, which is conducted in the months of March and April. Also, visit the popular attractions in the city by following Chikmagalur itinerary 2 days. Top of the waterfall can be reached by trekking. If you are opting for trekking, make sure you are physically fit. Wear proper shoes to avoid accident while trekking. You can visit the waterfalls any time of the day. However, day hours are preferred. How popular is Kalhatti Falls? 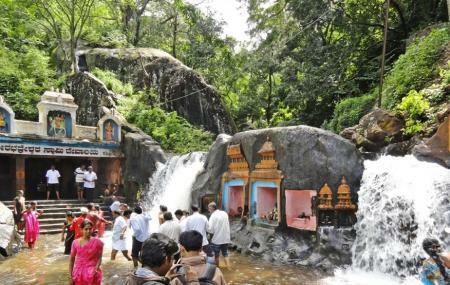 People normally club together Baba Bundangiri and Kalasa while planning their visit to Kalhatti Falls. People also prefer to end their day with Kalhatti Falls.